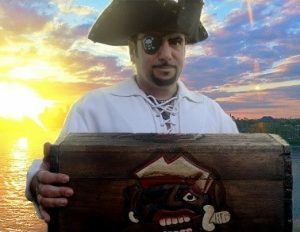 The Cap’n here with a little screed to inform ye of some changes we be making around the ship. First and most excitingly, we be pleased to announce the impending arrival of our new BrownBlack shade. 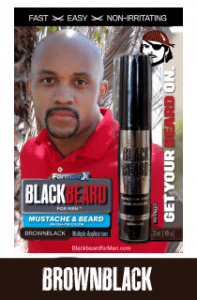 Blackbeard for Men BrownBlack be midway between our dark brown and black. It be arriving at Port of Los Angeles shortly and, barring unforeseen interference by the scurvy pirates of the Customs department, we should have it in the ship’s stores by Thanksgiving. We’re excited to be expanding our color line, and continuing to be offering our bearded brethren additional options. We’ll just keep coming up with new reasons for folks to abandon scurvy chemical dyes like Just for Men in favor of our gentle, hypoallergenic cosmetic formulation. But that not be all, scalawags. Our new Brown/Auburn be arriving as well, with a packaging redesign and a reformulated, less red formulation. It still be very similar to the previous Brown/Auburn, but the red be more of an overtone now and less overwhelming. We think ye will like the change. Alas, Clubfoot Farragut, our 19th mate and scullery maid, didn’t like the change and has been keelhauled. We be sending him family a few coins and our sympathy. Finally, we bring ye an update of our Light Brown. Alas, we had to pull that particular shade due to a manufacturing error that resulted in an inaccurate color. It be returning in spring 2016, rechristened simply “Brown” — slightly darker than before. The color should work well for light to medium brown shades. We appreciate each and every one of ye sailors, and we could literally not keep the ship afloat without ye. As well, we love to hear from ye. Drop the Cap’n a line and tell us amusing, salty anecdotes, and don’t be leaving out the juicy details, lads. We be nothing without the crew! P.S. Don’t be forgetting the Cap’n when it comes to holiday cheer, lads. Be mailing yer finest rum directly to me and I’ll personally see to it that it will get consumed gleefully. Arr.